A Multifunctional eco-friendly-roof cleanses the air, and controls temperatures. Even goats just love a very tasty living-roof. Ever visited a little place called "Coombs" on Vancouver Island in British Columbia? I have. My mother shops there quite often. Great market with a variety of products to choose from. 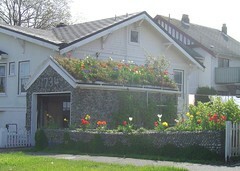 It's the green roof that people want to see as well. According to the history of this neat little marketplace just out of Parksville, the original owner in the 1970's longed to see what he was used to seeing in his native Norway. Grass roofs were very common there, and so it was done at the Market. Eventually goats appeared, and tourists were flocking daily to see the goats grazing on the roof. To this day, the goats are still grazing, and the Coombs Marketplace has become quite the little tourist attraction in addition to the allure of their products. Be sure to look it up if in the area. Who could turn down a meal of succulent vegetative-roof-covering? As interesting as a tourist attraction the living-roof is, the benefits of the eco-friendly-roof have been realized and utilized in different cultures across Europe for ages and ages. Sweden, Germany, and the UK to name just a few have what is thought of as tradition for centuries. The green roof is nothing new, however, as we shift to focusing more intently on the importance of the environment in these modern times, the uses and benefits of this type of green roofing is being looked at more closely. With proper design and technique, there are a number of purposes to be served. There are two types of green roofs. Intensive roofs mean thicker vegetation, which may support many more types of plants, but will be heavier and require much more looking after and upkeep. The "extensive" roof carries a much lighter and thinner layer of vegetation over an existing waterproofed layer. These vegetative-roof-covers are living, and give off oxygen that cleanses the air. They work to keep heat in during the cold weather, and keep the heat out on hot summer days. This type of insulation works wonderfully as a built-in climate control, and lowers heating and cooling expenses. This insulation also works to greatly reduce sound. The eco-friendly-roof can attract and provide for birds, butterflies and insects in non-urban areas where natural habitat has disappeared or is extremely limited. Storm water can be controlled, as long as roots in the plants are able to hold the water, and avoid run off and erosion of soil. Done properly of course, these vegetative-roof-coverings can extend the life of the original roofing, and increase the value of property. The living-roof creates space where there wasn't any. Want a garden? Just go "up" and there is all the space you need. Not only does it provide benefits to the environment, it just becomes a pleasing and enjoyable place for people to go to experience that "in touch with mother nature" feeling in an otherwise crowded, cramped downtown city. With this extra space and the gorgeous greenery, and the rooftop not totally covered in vegetation, employees have a place to go to eat their lunch, or enjoy a break from the job. Much more relaxing and contributes greatly to employee productivity. Businesses utilize this space to the fullest. Again, with the addition of spectacular greenery which is very pleasing and comforting to the eye, these newfound spaces provide the opportunity to socialize over simple or lavish lunches and dinners, depending where you choose to go. Rooftop bars are very common and have become popular hotspots in different forms for those looking for nightly entertainment, or just a quiet cocktail in a wide-open space. It's more and more common to see rooftop greenery and vegetation on apartment buildings, government buildings, businesses, some homes, and yes, even little country marketplaces. Say "eco-friendly-roof" and it definately means different things to different people.